I’m naturally a very curious person. Sometimes I feel a little sad that I can’t possibly read every book I want to and learn about every topic that I’m interested in. 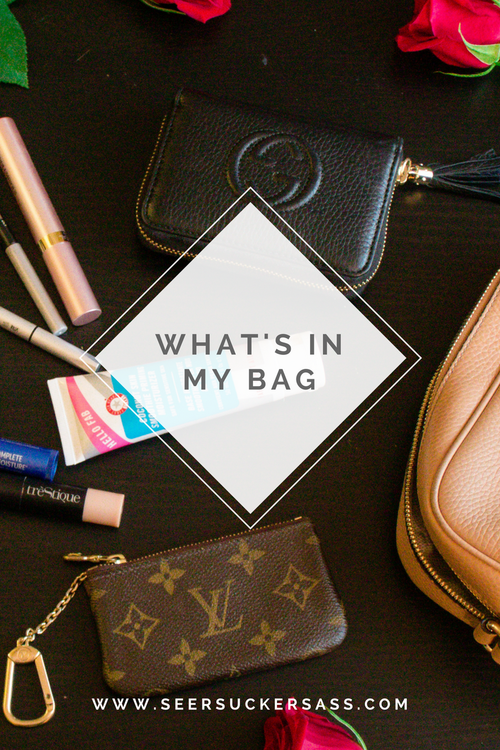 My favorite posts are those that give me an insight into a blogger’s life – what’s in my bag, a day in the life, what I eat, etc. If you enjoy posts like that, then today’s post is for you! 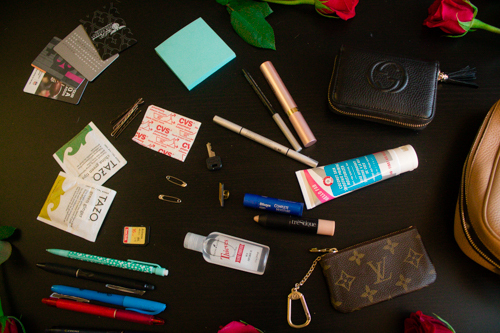 I’m sharing all of the stuff I manage to cram into my small but mighty everyday bag. Before we get into the contents of my bag, let’s talk about the actual bag. I carry a Gucci Soho Disco bag. It is the perfect size for my on-the-go lifestyle – it’s small enough so that it isn’t heavy and is deep enough to fit my travel camera in. The strap is adjustable, which I have come to really appreciate now that it’s cold outside and I’m wearing a big coat. I use a Louis Vuitton Key Pouch as my business card holder. I love the key chain clip because I can easily clip it on to the handle of my work bag. Skin Smoothie – I use this to give my skin a little glow. Highlighter – More glow 🙂 I just make a line on my cheekbones then blend it with my fingers. Brown Pencil – I fill in spots that are a little bare. This one is super easy to use. Mascara – I don’t really commit to mascara. This one is the exception, and I’m on my second tube. 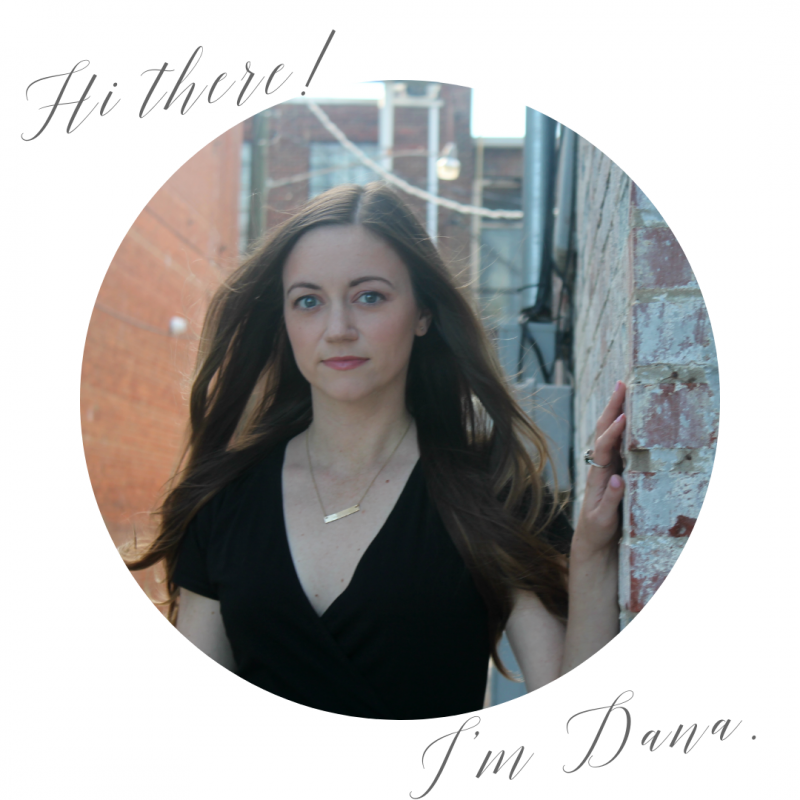 Eyeliner – Sometimes when I’m wearing all black, I like to add a little cat eye. This makes drawing one easy. I’m immunosuppressed, so hand sanitizer is a must have. I prefer Thieves Waterless Hand Purifier. It doesn’t have that gross “sterile” smell that a lot of sanitizing products have, and it doesn’t dry my hands out. Speaking of dried out, I cannot live without lip balm. I’m honestly surprised that there’s only one floating around in there! I’m currently using Blistex Complete Moisture Lip Balm for Chapped Lips. 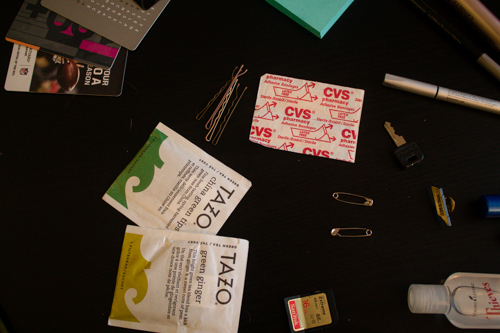 There is never a shortage of office supplies in my bag! These are my favorite pens, and I love this type of highlighter. I also keep an endless stash of Post-It Notes at my desk and keep some in my bag because I like to make to-do lists on them during meetings. I’ve gone from never having a camera card to always having one on me. This one was floating in my bag, but I keep one in my wallet, as well! My brother runs and my mom, aunt, and I all bring our cameras to meets to switch off taking photos of his team’s runners, so I keep an extra just in case one of us forgets our card or our runs out of storage mid-meet. I’m working toward a professional certification, and I spent five days in a row in a conference room from 8 to 5:30 learning. I was getting tea at breaks to keep me alert, and sometimes they would bring out the most random, disgusting tea, or tea that had so much caffeine that I would shake. Now I keep a couple of tea bags in my purse for when I need a little pick me up at a conference or training. Top-knots have become my go to hairstyle, so I keep a few bobby pins in my wallet in case I notice a stray hair or my bun starts to fall. I have to be extra careful with germs, so I keep band aids stashed everywhere. I also keep a little stash of safety pins. You never know when the neckline of your brand new shirt will unravel during a board meeting or the hem of your favorite J. Crew work pants will completely come undone. 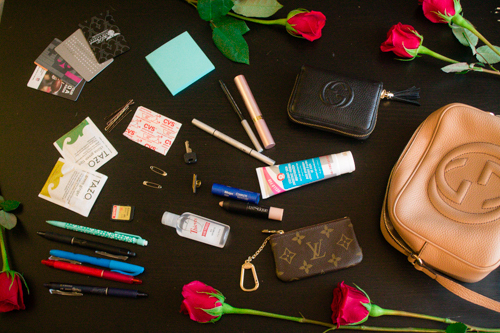 I want to hear from you – what are your must haves in your handbag? And how has your week been? Always fun to see what must-haves people carry with them! Love all of your must haves! First, obsessed with your bag. Second, love the First Aid Beauty Priming Moisturizer! 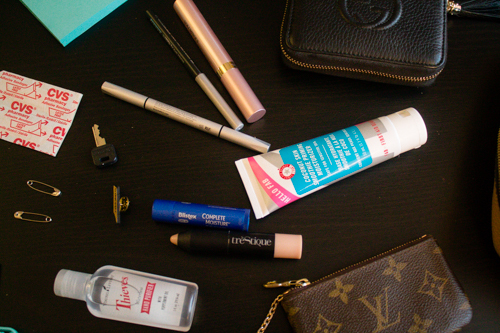 I don't keep much in my bag, but I definitely always have to have chapstick and hand lotion. Happy Friday!! I have that bag too and I LOVE it. I kinda wanted to buy the red one as well. I really want to try the Thieves Waterless Hand Purifier. I might get it in my next Young Living order. What a great bag! I love seeing what other people carry in their bags! The Gucci Disco bag carries so much more than I would have thought when I purchased it, I agree that it is the PERFECT everyday bag. Now seeing this it makes think that I really need some tea bags with me all the time. That's a great idea! I love these types of posts, I'm always super curious what others carry around with them! My bag is full of gum wrappers, receipts and numerous sticks of lip balm haha. Love your wallet! These are my fav posts! I love seeing what other people carry in their bags!! Your bag is so cute by the way!! Love seeing what people have in their bags. 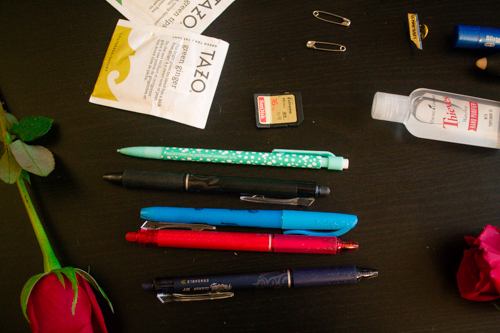 I'm definitely a pen hoarder and walking pharmacy haha – I have everything! I used to carry SO much stuff in my bag but I got so tired of rummaging through a bag full of things so now I only carry my wallet and the lip color I'm wearing that day haha! Band-Aids are seriously a must, oh and floss! haha! I feel like you learn overtime what to keep in your bag. I love treStique lip products so I'll have to try the highlighter.